REVOLUTIONARY HEARING AMPLIFIER: This new BTE amplifier can amplify sound up to 40 decibels. Its unique noise reduction technology allows you to hear with most clarity. 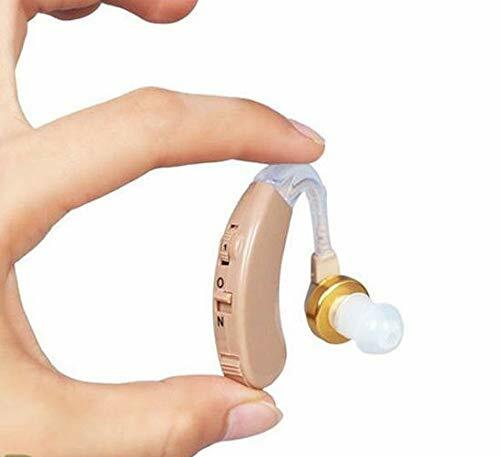 REMARKABLE DESIGN: This hearing aid is super small, specially designed by our expert audiologist keeping in mind the unique hearing requirement of every individual. HIGH PRECISION: The device has an adjustable volume control with 6 volume levels for better access and control. COMFORTABLE AND CONVENIENT: This universal BTE hearing device is designed to fit all. It's comfortable in either ear. For easy use, it comes with a simple on and off button. EXTRAORDINARILY LASTING: Our hearing amplifier is made of high quality materials, making it rugged and durable. It consumes little power, hence decreasing the expenses on purchasing batteries. Each hearing amplifier comes with 3 different sized ear tips guaranteed to fit your ear. To maximize your experience select the size that fits you best and eliminates any background noise. With the intention of bringing the world to your ear, USAmplify has brought up this cutting-edge BTE amplifier with the most convenient features, designed to fit right behind your ear. It's an ideal choice for those who require optimal quality sound. If you have any questions about this product by USAmplify, contact us by completing and submitting the form below. If you are looking for a specif part number, please include it with your message.